In a post in late November last year, Testing the performance of price-to-book value, I set up a hypothetical equally-weighted portfolio of the cheapest price-to-book stocks with a positive P/E ratio discovered using the Google Screener, which I called the “Greenbackd Contrarian Value Portfolio”. The hypothetical portfolio is based on Josef Lakonishok, Andrei Shleifer, and Robert Vishny’s (“LSV”) Two-Dimensional Classification from their landmark Contrarian Investment, Extrapolation and Risk paper. The portfolio has been operating for a little over 3 quarters, so I thought I’d check in and see how it’s going. The portfolio is up about 22.4% in total and 20.9% against the index. It’s volatile, but I’ll take volatility for a ~20% gain in an essentially flat market. The results are tracking approximately in line with the results one might expect from LSV’s research. Interesting screen, but my calculator tells me the average return is 0.27% (ie less than 1%), and not 22.4%. Looks to me like this selection of stocks matched the market over this time period. As a professional investor often working in the small/microcap space, I can confirm that bid/ask spreads on these types of stocks can be unusually wide, and irresponsible “traders” can move the share prices around wildly. I would estimate I lose several percentage points of gain on both sides of the trade, but the potential for extraordinary returns on these illiquid stocks is worth the time and effort. The “friction” in trading is challenging, but not debilitating. Limit orders and a great deal of patience is critical to building and closing positions, but it can be done successfully. For example, $100 invested in BBEP would be worth $151.30 today, and $100 invested in GASS would be worth $70. This could be embarassing for me, but could someone please explain how Tickerspy calculated a 22.4% gain in this portfolio? Assuming the portfolio positions were equally-weighted, I am actually calculating a net loss since inception. 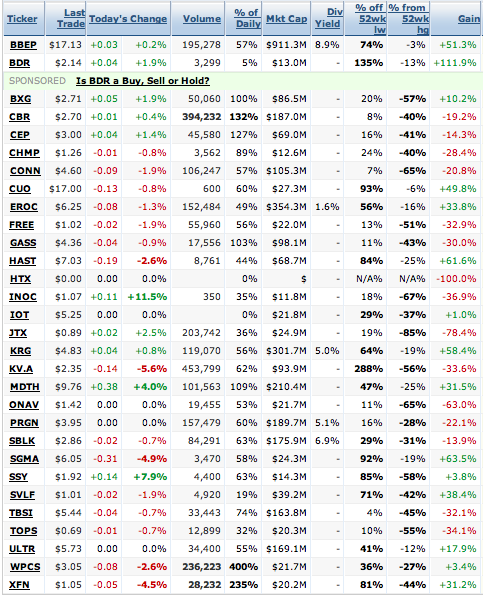 Looking at the “Gain” column, I don’t see enough outsized gains to offset the significant losses in other positions. I set up my own spreadsheet to track these positions following the blog post. I used the closing prices on 11/20/09 as my starting point, and use a live data feed for a real-time gain/loss summary. I extracted HTX from the list when it went to zero, but even without that position, I calculate an average gain of only 2.23% for the Greenbackd portfolio, vs. a gain of 2.69% in the S&P 500 (as of 9/16/10). The above post could simply have some incorrect decimals in the return figures (i.e. returns are 2.24% and 2.09% for the Greenbackd portfolio and S&P, respectively), but that wouldn’t explain the chart below the return tables. Any assistance or an explanation of what I’m missing would be greatly appreciated. it would be interesting to see a little more cross sectional detail; a plot of log(mkt cap) vs excess return would be interesting? These are great results, but I wonder what the actual results would be when you have to actually buy and sell these companies. Most are low liquidity low market cap companies and I would imagine that buying even a small position would shift the price significantly. Same story with selling. Love the simplicity of the screen. I think the index must have moved 2.09% (not 20.9%)?